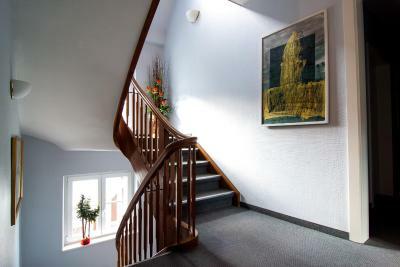 Hotel is located almost directly at tram stop, very convenient to travel to University of Ulm and/or train station. Nice historical-like building, nice staff, good overall cleanliness, no broken things. Shower, hot water and room heating are good and powerful. We came for the Christmas Markets but we also enjoyed visiting the Cathedral and the museum and exhibit on Bread culture. Easy parking near public transportation to center of town. Good breakfast. Charged exactly as promised. The staff was very hospitable. Thank you for a great stay! We only spent one night with the family, but it was perfect for a good rest. The beds are very comfortable and the rooms have a lot of space. The staff were really friendly and made us most welcome. The staff helped us with travel problems ie bus times etc. The staff.....excellent. Funny how a tiny wee place hidden in the suburbs can find great, smiley, happy hotel staff, and the much bigger chain hotels get all the grumpy ones. Good clean room, and the wifi sort of worked. This was a delightful hotel, with very good facilities. The communication from the hotel about opening hours of the reception was also excellent. The parking was great, right out in front and it was a relatively short walk to the centre of town. The staff were fantastic. The rooms were comfortable and clean the staff were helpful and friendly. Hotel Garni Lehrertal This rating is a reflection of how the property compares to the industry standard when it comes to price, facilities and services available. It's based on a self-evaluation by the property. Use this rating to help choose your stay! 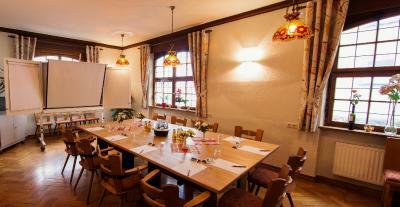 Centrally located in Ulm, this hotel is just a 5-minute drive from Ulm University and the clinics. 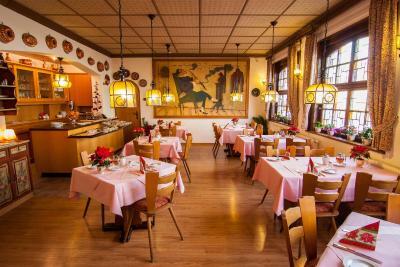 Hotel Garni Lehrertal offers soundproofed rooms, free Wi-Fi, and a daily breakfast buffet. The nonsmoking rooms of the privately run Hotel Garni Lehrertal feature a flat-screen TV, a seating area, work desk, and modern bathroom. Allergy-free rooms are also available. 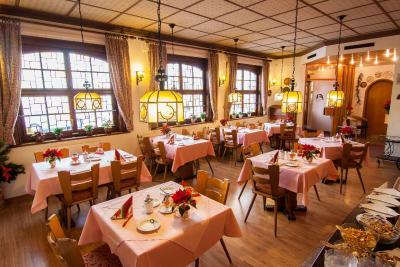 A traditional German buffet and free newspapers are provided in the Lehrertal’s brightly decorated breakfast room. The Lehrertal bus stop is just 150 feet from the Hotel Garni Lehrertal. The Old Town district of Ulm is about 1.2 mi away. Free private parking is available at the Hotel Lehrertal and the A7 is a 10-minute drive away. Ulm Main Station is 0.8 mi away with direct connections to Augsburg and Stuttgart. 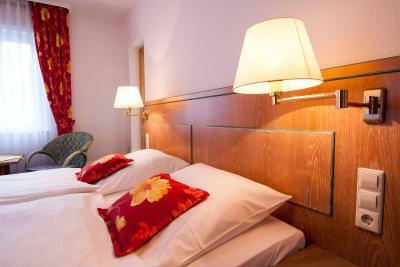 When would you like to stay at Hotel Garni Lehrertal? Rooms have carpeted floors and feature wooden furniture. This room has a flat-screen cable TV, seating area and free toiletries in the bathroom. The room features a larger bathroom. House Rules Hotel Garni Lehrertal takes special requests – add in the next step! Hotel Garni Lehrertal accepts these cards and reserves the right to temporarily hold an amount prior to arrival. Please inform Hotel Garni Lehrertal of your expected arrival time in advance. You can use the Special Requests box when booking, or contact the property directly using the contact details in your confirmation. Hot meals at breakfast will make it perfect. Also sound insulation between rooms could be better. The hotel was in darkness on arrival and was not staffed. Access via a rear door with key number. Not welcoming after a long drive. No kettle in the rooms to make hot drinks. The low bed. I've got a gammy leg which won't bend so low beds are impossible to get out of. Luckily I wasn't alone but if I was, I'd've move on. Also, the bathroom was very tight....big enough, but they could've made better use of the space. I ordered for 2 adults. Only 1 bed was prepared. ... in the morning discussion started to pay extra for second adult. Mismatch between my order and operations in the hotel. Not much choice of places to eat in the immediate vicinity. It was winter, dark, cold and wet. Only one place was suggested. Tea/coffee making outside of breakfast hours not available. Nice breakfast, friendly helpful staff. Comfortable room. Good location; walk to centre very easy. No easy access s to refrigeration for insulin. The hotel did not have reception service between noon and 6:00 pm.